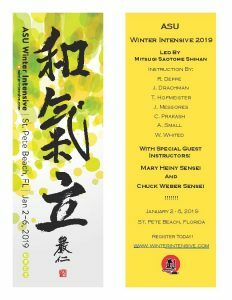 Aikido Shihan, Mitsugi Saotome, will lead the 2019 ASU Aikido Winter Intensive seminar at the Sirata Beach Resort in St. Pete Beach, Florida. The event will be held from January 2, 2019 to January 6, 2019 (Wednesday – Sunday). This will be the eleventh year the event will be held at this popular location. By popular demand, the five-day camp schedule will again be held after the holiday period at the beginning of January. This event date will allow attendees to enjoy the holidays with their families, and still start the new year with world class training after the holiday season. In addition, travel and hotel arrangements have proven to be much easier: plane fares are better, airports less crowded, and room rates at the Sirata are still at the significantly discounted rates (like last year). With this, our second year of management by the Aikido Schools of Ueshiba (ASU), our goal is for Winter Intensive 2.0 to build on the spectacular success of last year by listening to the feedback you gave us and making adjustments accordingly — all while continuing the tradition of world class instruction by some of the best aikido teachers anywhere. (Check out the truly impressive teaching roster!) Classes will include intensive training for both open hand and weapons work. There will be discussion and application of internal, technical, and philosophical concepts that will advance your understanding and your effectiveness. An extended afternoon break will allow time to relax and enjoy some of the best that Florida in January has to offer, with an expanded extracurricular schedule so there will be plenty of options to choose! Saotome Sensei is 81 years old now. 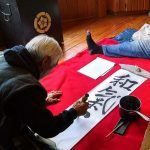 He is still active and still awesome, and one of the last living Uchideshi of the Founder. Seize this opportunity and come see him. Now is now. If you have relevant products or services you would like to offer to our dojo community, please complete and return the vendor information form right away so we can make sure to save a spot for your display. The seminar is owned and operated by the Aikido Schools of Ueshiba and the members of its Board. Brand new mats exclusively for this event will be provided through the generous dedication of the ASU Board.